Want to prevent problems many leaders unwittingly create for themselves? Looking to create a quality pool of leadership talent ready to step up and lead? 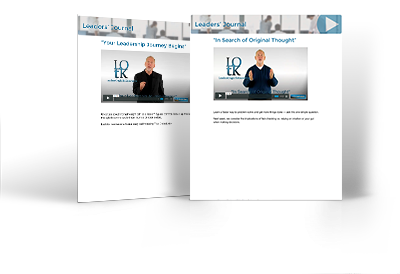 The Leaders Journal is a weekly video series — 3-5 minutes long — delivering practical tips, ideas and challenges, focused on specific problems and key leadership components. To-the-point guidance and a practical call-to-action gives you specific way to practice new skills each week. 52 Total Episodes. I absolutely LOVE the content your team has put together. We’ve even incorporated the videos into our weekly team meetings, and are really seeing some great results! Be ready to make a leadership impact immediately. Get leadership training without disrupting business operations. This is a great series on leadership by a master of the craft - Phillip Van Hooser. Phil's series encompasses lessons from his past thirty years in business and training and Phil does it with many stories and a conversational tone that keeps the listener engaged. Ive recommended it to all of my leadership level employees and even the junior leaders who are climbing the leadership ladder quickly. I highly recommend the Leaders Journal led by Phillip Van Hooser. Fully enjoy the weekly leadership tips and guidelines. These are great presentations allowing for a quick boost to strive to improve the practice of quality leadership. The presentations are done in a style providing an 'ah ha' feeling leading to quick implementation with lasting results. If you actually listen and give yourself the chance to learn there is a lot here for you. Common sense approach to problem solving. Helps to keep you on target with your goals and gives you a chance to go back to review if your having a particular problem. The LJ is very practical common sense series of important principles that all leaders should aspire to master to the point of becoming intuitive. Spot on.